Southwest France is a huge area that covers a large swathe of France. It runs down the Atlantic coast from Bordeaux to the Spanish border, and extends east past the city of Toulouse. Within it, several wine appellations cover a variety of climates, soils and expositions. Two of its best known names are Madiran and Pacherenc du Vic-Bilh, but in fact these two appellations are just one geographical area: Madiran is used solely for red wines, whilst Pacherenc is for white wines. But the vineyards all fall within one boundary. Like all of the Southwest, there has been no rush to embrace ‘international’ grape varieties in Madiran and Pacherenc. 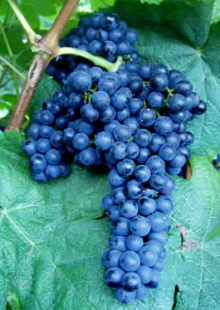 Traditional, indigenous grapes of the region still dominate. For the red wines of Madiran that means Tannat, the rich, dark, tannic variety that was once used to ‘reinforce’ the red wines of Bordeaux. Blended with small percentages of the local Pinenc (also known as Fer Servadou), Cabernet Sauvignon and Cabernet Franc, all of Madiran’s best wines are dominated by Tannat. For white wines, Petit Courbu and Petit Manseng dominate, with Arrufiac and Gros Manseng often appearing in the blend. The Tannat wines of Madiran have been famous for centuries, and have long been compared with their cousins from further north in Bordeaux. The wines had a reputation for longevity, but also for their huge tannin structure that meant they were unapproachable in their youth and required years of cellaring. However that has changed. The wines are still powerful and structured, but better understanding of tannin management has made wines that can drink well much earlier. Geographically the region lies between Bordeaux and the Basque country of northern Spain, and the style of the white wines shares some aspects of both. Just over the Pyrenees in Txakoli, the Izkiriota is a synonym for Gros Manseng and Izkiriota Ttipia for Petit Manseng. The Pacherenc dry wines range from juicy, fresh, herby and vibrant styles made in stainless steel tanks at low temperature, to long-lived, oak-fermented styles. The region is also famous for its sweet wines, particularly when matched with the local foie gras. Long, dry autumns mean late-harvest wines are popular, sometimes labelled as ‘Octobre’, ‘Novembre’ or ‘Decembre’. Unlike some of the smaller Southwest appellations, the wines of Madiran and Pacherenc du Vic-Bilh are relatively easy to find in the UK, though mostly in restaurants and independent retailers. The wines strike me as well-made, approachable and characterful, with the red wines still capable of long ageing for a decade or more. High production costs and relative scarcity mean there are no £5 examples around, but then serious, age-worthy reds of great substance rarely cost more than £20 either. That makes these very interesting wines indeed. There is absolutely no doubt that Alain Brumont, owner of both Château Montus and Château Bouscassé, is the region’s superstar. Brumont owns vineyards in every corner of the Madiran/Pacherenc appellations, many of them planted on ‘virgin’ land over the past 30-odd years. Brumont (shown right in one of the Montus vineyards) is passionate about the Madiran terroir, explaining how his Montus vineyards lie mostly on steep, gravel and clay slopes covered with large pebbles whilst Bouscassé is situated on a rocky plateau covered in clay. His Côtes de Gascogne vineyards lie mostly on grey clay and crumbled limestone. Brumont also believes in dense planting with 7,500 vines per hectare, and subsequent low yields aided by green harvesting to remove some of the growing bunches, carried out three times during the growing season. 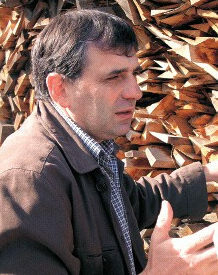 He introduced new oak barrels to his wine making regime in 1980 – unheard of in the area at the time. The new 600-litre barrels tend to be filled only with white wine, before being cascaded down to make the red cuvées in their second year. When some of Brumont’s wines began to attract massive scores form American wine critics the spotlight was thrown on him and his estates as the poster boy for the Madiran region. One senses there may be a certain fatigue amongst the region’s other growers that so much attention is focused on Brumont, but then his vineyards are exemplary, his cellar immaculate and his wines excellent by and large. Brumont may well be a big fish who does not lack confidence, but there is ample evidence to suggest that confidence is well-founded. The taming of Madiran’s famous tannins is not only down to more precise vine cultivation and winemaking, but to technology. In particular, one technical development called micro-oxygenation has become the single most effective weapon in the winemaker’s armoury for altering the tannins in a wine to make them softer and less aggressive. And the technology was invented in Madiran at the neighbouring estate to Château Montus, where in 1991 Patrick Ducournau first experimented with the slow, carefully controlled release of pure oxygen bubbled through a tank of wine. This mimics the effect of much longer barrel ageing where gentle aeration causes the polymerization of tannins into larger molecules. Left: Patrick Ducournau picture courtesy Reussir Vigne. Montus is one of the few estates that does not practice micro-oxygenation, preferring instead a long barrel ageing for its wines. But elsewhere the practice has changed the nature of Madiran to make the wines more approachable at an early age. It has also spread to wineries around the world making Monsieur Ducournau one of the most important figures in modern winemaking. A favourable spotlight was also focused on Madiran in the book The Wine Diet< by Professor Roger Corder, published in 2006, where Polyphenols in wine were praised for their health benefits, particularly in protecting against heart disease. 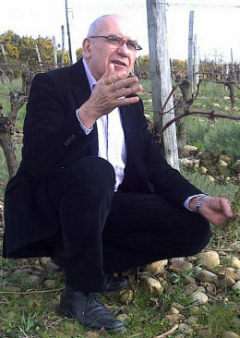 Professor Corder found that the Tannat wines of Madiran consistently showed some of the highest levels. See all UK stockists of Madiran on wine-searcher, and all UK stockists of Pacherenc du Vic-Bilh on wine-searcher.